RapidRide H, the new line that will replace Metro Route 120 in downtown, Delridge, White Center, and Burien, will feature 0.3 mile stop frequency and new bus lanes, according to the latest designs. SDOT and Metro plan to finish design in spring summer 2019, and open bidding for the project by the end of the year, with the goal of opening in 2021. Metro’s Jerry Roberson and SDOT’s CJ Holt presented the 10 percent plans for the H line to the City of Seattle’s Transit Advisory Board on Wednesday. They also commented on preliminary RapidRide plans for the Rainier Valley/Route 7 corridor. The H line will serve a heavily transit-dependent, highly diverse area, and will make an essential connection to the Link system at the Delridge stop. Burien, White Center, and the south end of West Seattle won’t see Link service until a future Sound Transit package, if ever. The presentation focused mainly on right of way improvements. The entire corridor in Seattle city limits would be rechanneled. Traffic calming and lower speeds are a priority throughout the corridor. “I don’t like to use the term ‘road diet,’ but this is a safety enhancement road diet,” Roberson said about plans for a particularly dangerous stretch of the route, a winding road segment of Ambaum Boulevard SW in Burien. Other improvements include signal changes, stop consolidation, and pedestrian mobility and safety improvements. 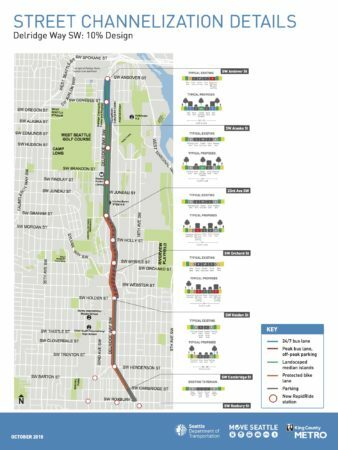 According to Holt, SDOT would perform “full street reconstruction, including drainage,” on the more than two mile long stretch of Delridge between the West Seattle Bridge and Sylvan Way. SDOT would construct the most substantial right of way changes between SW Andover Street and SW Alaska Street, on the part of Delridge Way that connects to the West Seattle Bridge. That segment of Delridge is often congested during peak hours, so SDOT would implement 24 hour BAT lanes. The segment would also feature a planted median with a turn lane. Farther south, SDOT plans to convert existing parking lanes between SW Graham Street and SW Holden Street into peak hour BAT lanes. SDOT would install a northbound queue jump at Sylvan Way SW, and a southbound queue jump at SW Holden Street. The City of Burien Metro would install BAT lines for its segment of the line, between 128th and 148th. A significant portion of the route will not see dedicated right of way for buses. “We are maintaining a lot of the parking between Alaska and Graham, which is a community concern,” Holt said. There, neighborhood residents have raised objections to consolidating stops to a 0.5 mile density. Roberson and Holt said that the agencies are taking community concerns into account in planning. Rainier Valley residents have raised issues like the hilly geography of Rainier Avenue, the heavy use of the route for both local and downtown trips, and the danger of area street crossings as reasons to preserve existing stops. Though Roberson didn’t have detailed, final figures available, he did estimate that the proposed improvements could yield 15 percent reduction in end-to-end travel times. This post has been updated to correct the agency responsible for the construction of the Burien BAT line, and the correct timeline for final design. What makes this worthy of RapidRide designation? How much faster will these buses go? Is the only criteria to be “RapidRide” paid fare areas? As more corridors get “RapidRide” status, I wonder if we would be better to have two designations — one for operational improvements like this and one for truly mostly limited-stop, exclusive-lane systems. Maybe have RapidRide lines and SmartRide lines? I have the same question. These lines don’t really seem any different from other bus lines except in name. They still get stuck in traffic and seem about as fast as other lines. Am I missing something that the “RapidRide” designation does to improve these lines? More off board payment is the main thing. 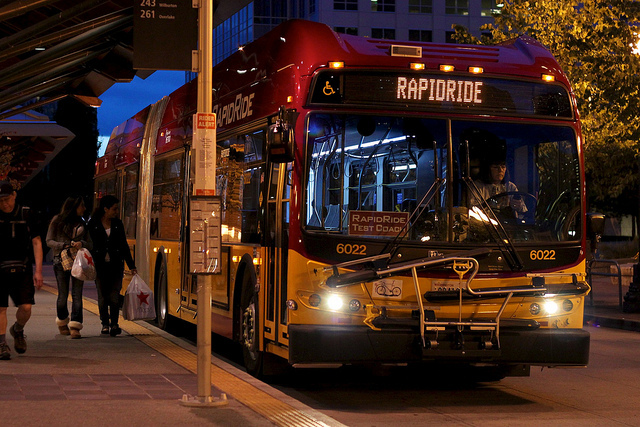 There are plenty of spot improvements on various lines, but the RapidRide routes are the only ones where most of the stops have off board payment. The funny thing is that the situation is similar to BAT lanes. As we add more of it for more routes, the difference becomes minimal. All the buses on Third Avenue will have off board payment (at least for Third Avenue) and hopefully that will spread to other areas (I would like to see it the areas close to train stations that are primarily used to serve buses, like Mercer Island, 145th, Northgate, etc.). Personally, I think it is not the least bit important if a bus route is branded as being BRT (even though IDPT puts some weight to it). At the end of the day, it won’t matter. If a bus is faster, or more frequent, folks will take it no matter what it is called. I’m curious how this will playout on northbound Rainier between McClellan and I-90. Morning commuters queue and back up for a mile or more south of the interstate, which causes the 7 to have to weave in and out of clogged traffic as it moves to and from stops. I wonder it the RapidRide improvements will help with this. @Scott — In my opinion, the corridor you mention (used by the 7) is a lot more important than the 120. The 120 is an important bus, but it carries fewer riders, carries fewer riders per hour and is more reliable. In other words, the gains by making the 7 faster would be much bigger. You can see this in the planning documents for the “RapidRide+” projects (http://seattletransitblog.com/2015/12/21/rapidride-the-corridors/). At that point, they thought they could get a 15% speed improvement on the 120, and a 33% improvement on the 7. Part of the plans required the use of buses with doors on both sides (so that they could run down the middle of the street). Unfortunately, that costs more money, and the city simply doesn’t have it. The previous administration was corrupt, and promised these projects, but knowingly didn’t allocate enough money for them. As a result, the city is basically just finishing up the programs they started, which weren’t designed with need in mind (we aren’t improving the most important corridors first) but simply when they started. Improving the 70 and 120 will be very nice, but not as important as improving the 7, 44 or 40. How much faster will these buses go? If accurate, that’s not trivial. I’m not criticizing the project. I’m simply pointing out that we are using the same terminology for different levels of speed improvements. full grade separation is the only way to make it “rapid”. any segments that share with the notoriously slow and bungling 1 person per car Seattle drivers will be delayed and never on time. This. If Metro wants BRT, they have a *long* way to go as far as getting a bus line that is actually rapid. Even 405-so-called-BRT is not much more “rapid” than good old Sound Transit express busses (though the boarding and offloading time improvements are still welcome!). If we are really serious about getting real BRT in this town, stop calling these knock off systems BRT. Or anything with the word “rapid” in it, for that matter. To think Cinderella had an insignificant sister. You learn something new everyday. Sorry, but that is just unrealistic, and ignores one of the big benefits of open BRT. Too much time is spent focusing on what constitutes BRT (I know I’ve spent too much time on it). To be clear, just throwing a little paint at something and calling it BRT is ridiculous. But in the end, it is just a name, and what matters is whether it works or not. Open BRT has its place. The old bus tunnel could be considered an open BRT system, especially in the “free ride” days. You could take a ride from one downtown station to the other without paying. Rides were fast within the tunnel, as buses typically spent little time picking up or dropping off passengers, and when they did, another bus would just pass that one. By some definitions this qualified as BRT (very fast, very frequent) but certainly not for the whole line. Buses leaving downtown were reliable and fast, even if they encountered congestion outside the tunnel. It was clearly an improvement over what existed then (and what exists, or what will exist for those buses soon). Ideally you focus on the most important slowdowns. I’m not saying this plan does that, but if it did, then there is nothing wrong with that. That means that in areas where there are lots of cars, you have bus lanes. But in areas where you don’t, you don’t. Anyway, what you are talking about — total grade separation — tends to be very expensive. It usually requires running in the middle of the street (no BAT lanes, only bus lanes). Even then, you can get delays just as major subway systems get delayed. The point is, you want to get the biggest bang for the buck, and not obsess over whether it is an “ideal system”. As for the “405-BRT”, it is a joke. The problem is not its moniker, but its design. It treats park and ride stops as destinations, not starting points. Too much time will be spent getting in and out of the bus lanes instead of quickly moving people to Lynnwood, Renton or (the big destination) downtown Bellevue. A better approach would be a series of overlapping express routes with freeway stations (like Totem Lake) for the handful of folks who are going from suburb to suburb. That would likely be more expensive (and probably less frequent) but trips of that distance are hardly ever spontaneous, which means speed (not frequency) tends to be more important. If I live in Lynnwood and want to get to downtown Bellevue, I would much prefer a fast bus that runs every 15 minutes versus a slow one that runs every 10. I don’t think the time cost of serving the intermediate stops is as big as you make it seem. Part of the ST proposal is to add shoulder bus lanes on I-405, allowing the bus to get to the right-hand Brickyard stop and Bothell stop without needing to idle in traffic. And, I think the frequency degradation would be worse than 15 minutes vs. 10, and it would completely exclude some of the trip pairs, like Lynnwood->UW Bothell. Off peak, when the combined route is supposed to run every 15 minutes, branching would likely mean that each branch runs only every 30 minutes, with some of the branches shutting down on evenings and weekends altogether. “Grade separated” means no level crossings (i.e., intersections). That was never realistic for Delridge, not unless they put Link there instead of the junction (which some people have advocated). Grade-separated BRT would require a pair of freeway lanes like the direct-access ramps at some exits or the part of I-90 between 4th Avenue and I-5. That’s not happening in Delridge, and the residents would raise holy hell if it were attempted. So the best alternative for Delridge is a pair of transit lanes. That would have level crossings but it would take the buses out of SOV congestion in the same lane. Yeah, there are a couple levels between “grade separated” and stuck in traffic. There are BAT lanes and transit lanes in between. It really comes down to two issues: congestion and intersections. Intersections can be a pain, because a bus (or train) can be forced to wait there. But this is common throughout the world, and is not necessarily terrible. Ideally you have signal priority (like Link) and it is not downtown (like Link). Similarly, BAT lanes can be useless, or they can be a huge help. If the right lane is clogged anyway with turning cars, they are useless. If almost everyone is trying to go straight, they are great. Transit lanes are much better, but that requires more work. Either you run the bus in the middle of the street, or you have special signals that allow a car to take a right in front of the bus. The latter can make the signals longer (which means it still isn’t ideal, even if you pay for it). The bike lanes on Second work this way. Center running is less common, and either requires contraflow on a two way street (which means four lanes of traffic, all going in different directions) or vehicles with doors on both sides. You can also have contraflow on a one way street (meaning only the bus runs that direction) which seems like a pretty straight forward and simple solution to avoid traffic. The drawback there is that it becomes difficult to pass. The point is, ideally you have grade separation, or 100% transit lanes (along with signal priority) for your transit line (bus or rail) but that is unrealistic for corridors like Delridge. I’ve said this before, If you want RapidRide to be rapid, the buses have to travel in a straight line. Nobody heading north on 15th approaching White Center in a car would do all those extra turns to go by Westwood Village, so bus riders shouldn’t have to do that, either. Anywhere south of Roxbury, there is no bypass route available (except for rush hour), so you’re pretty much stuck riding all the way around the detour as a condition for getting pretty much anywhere on a bus. If the purpose of the detour is to connect with the C-line, there’s an easy solution – just extend the C-line another few blocks down Roxbury to 15th, instead. Are there really *that* many people riding to Westwood Village that it’s worth delaying everybody else on the bus, just to save those people four blocks’ walking? I agree. Furthermore, the 560 already provides the connection between Westwood Village and Burien (although admittedly less often). The two routes are backwards. The 120 makes a detour in the middle of its route, while the 560 has limited stops there before its end. This should be reversed. The 560 should have several stops there (as many as the 120 did). The only people who have a slower ride are those at the end of the line. Meanwhile, the 120 should just go straight on Delridge (as you suggest). The more frequent bus shouldn’t make a detour in the middle of the route, while the less frequent bus should become more of a coverage route towards the tail. If people want more service on Roxbury between 16th and 26th (instead of more service on Delridge at its southern end) then the 60 could be moved there (without requiring any additional turns). I’m not sure that is necessary though. The Delridge segment seems like it has as many people, if not more, than the detour. It certainly has more people per minute of service, which has to be a consideration for a bus like this. That means the change is not just about making the trip from Burien to Seattle faster (and the overall route more reliable). It is about serving other people, who right now don’t have a great way to get downtown. Why should someone who lives in an apartment off Delridge (https://goo.gl/maps/L4v4rQPe2nS2) have to walk five minutes to catch the 120, while someone off Barton (https://goo.gl/maps/X2rUpUP2n672) gets both a short walk to the 120 *and* a short walk to the C.
As for connecting the C and the 120, I wonder how many people do that. Here is another example of where it would be really nice to have stop data from Metro. My guess is not that many people do that. Except for the stops on Fauntleroy, they could achieve the same thing by taking the 128 (although again, that would be less frequent). If this really is important, then like you said, they could just extend the C. Like the 560, doing so would only cost someone in Westwood Village a little time (and only in the northbound direction). Everyone else wouldn’t notice. By my calculations, making the switch would save the system some money. Expanding the live loop for the C costs about four minutes (not counting the extra stop on Delridge). Avoiding the detour saves the 120 about three minutes. But those three minutes are saved both directions. Thus assuming there are as many runs of the 120 as the C, it might actually save money, while providing a better transit experience for more riders. Westwood Village if a hub urban village like Mt Baker, so it’s more must-serve than White Center. It already has more big-box stores than White Center has, and it’s expected to get larger. That’s part of West Seattle’s strategy for containing growth so it doesn’t infect most of the neighborhoods (including Delridge). If you don’t have density in your neighborhood, then the buses have to detour to where it is. Or as somebody told us when my friend was looking at a room in a house there and asked, “Where is the supermarket?” and she said she goes to White Center for it. But the point is, Westwood Village is served (by several buses). It has very frequent service to downtown and the Junction via the C. It has less frequent, but regular service to Burien via the 160. It really doesn’t need extra, one-seat service to Delridge. I really doubt there are that many people that ride the 120 from Delridge and get off at the mall. Besides, depending on where you are going, it is faster to get from a bus stop on Delridge than it is to get to the other side of the mall (https://goo.gl/maps/qqs6X9kQUyn). This all just legacy service, back when Metro didn’t have fast or frequent buses. The idea of making a detour just to save a couple minutes walking makes sense when the buses are never very fast or frequent and there are few alternatives. But now there are other buses, and as long as the buses spend a huge amount of time making detours, then the route won’t be fast. The only way that detour would make sense is if Westwood Village ridership was much larger than every place to the south. I really doubt that is the case, or there would be talk of truncating the route (even if it meant truncating some of the time, like with the 3 to Madrona). Actually, the Westwood Village deviation is worse than a legacy routing. Until the fall 2012 service change, the bus actually did stay on Delridge in a straight line. The deviation was added as part of the service restructure that created the C-line. Unfortunately, I cannot find anything online debating the merits of the proposed deviation at the time, just documents from Metro saying it’s happening, without an explanation. The timing of the change suggests that some planner at Metro thought that the 120 and C needed to connect, but I don’t really know the rationale behind it. That said, I was able to dig up an old STB post describing ridership patterns on the 120, back in 2011, one year before the Westwood Village deviation went into effect. As you can see, each bus was carrying an average of about 20 passengers as it passed the stop at 15th/Roxbury, which means about 20 people being subjected to the detour (plus whatever future ridership growth happened between December 2011 and the present). By contrast, the closest point to Westwood Village under the old route (Delridge/Barton) averaged about 3 combined on/offs per trip. The walking distance is either 0.2 miles or 0.3 miles, depending on whether or not there exists a staircase connecting 22nd Ave. to Barton (I think there is, but not sure). From what I can tell here, the ridership stats from 2011 do not support the Westwood Village Deviation. Even if we assume that all three people getting off at Delridge/Barton are walking to Westwood Village (which might not the case, as some might be walking to their homes located east of Delridge), the deviation is still adding 3 minutes to the trip of 20 people (60 person-minutes) to save 5 minutes of walking for 3 people (15 person-minutes). By adding the deviation, Metro was basically saying that the time of the people going to Westwood Village is 4 times as valuable as the time of everyone else on the bus (really more, because the service hours consumed by the deviation necessitate less frequency, which affects the experience of everybody, along the entire route, whether passing through the Westwood Village area or not. Of course, instead of questioning whether this deviation really makes sense, Metro is doubling down on it, encasing it with RapidRide-branded bus shelters. Westwood Village certainly needs some bus service, but it’s not so important to justify delaying everybody south of it, trying to get to a destination that is orders of magnitude larger (downtown Seattle). White Center/Ambaum/Burien->DT Seattle is already quite a long bus ride, with no bypass route available to make it faster, and the deviation just makes it worse. It’s also not like the direct route can’t be used to reach Westwood Village. According to Google Maps, we’re talking about a 5 minute walk. On top of this, as RossB said, there is the 560 (which I forgot about in my previous post), which gets you closer, at least coming from the south. Looking at the Google Earth satallite view, I don’t see a great deal of density around Westwood Village to warrant deviating the bus. It’s a shopping center with some big box stores, surrounded by giant parking lots, in turn, surrounded by mostly parks and single-family homes. If anything, the residential density east of Delridge Way, which would be better served by the direct route, looks higher. There are a couple blocks of higher density at the northeast corner of Westwood Village, but, even with the deviation, the 120 doesn’t go there anyway (it serves only the SE corner), so those people would need to walk up the hill to Delridge to get to the bus, anyway. In any case, I also question the general wisdom of “buses must detour in search of density”, as, if you do that in the extreme, you just end up with a spaghetti of zig-zagging routes that’s not very useful to anybody. Again, Westwood Village is a 10-minute walk to White Center, so it’s not like if the bus doesn’t deviate, she can’t get there. There is also the 560, which could be modified to stop more frequently in the West Seattle/White Center area. If that’s not sufficient, the C-line could be extended to White Center. The deviation has nothing to do with ridership levels on the 120 or connecting to the C-Line. It has to do with meeting an equity goal, whereby there is currently no grocery in the Delridge corridor. Transit-dependent folks were riding into Downtown (which didn’t use to have a grocery store either) or into White Center. Residents were unable to access the main shopping area in West Seattle Junction. Walking “a few blocks” with a couple bags of groceries or children or a stroller in town aren’t realistic travel options. And especially aren’t where the hill grades are concerned on either end of Delridge. Turning Westwood Village into a transit hub actually seemed to be an engineering decision made AFTER the proposal to have the 120 deviate there. It was made at the same time the 50 was routed through North Delridge, providing a transfer up to the Junction and shopping access from the north and south ends. This seems like a tempest in a teapot. The deviation is six blocks on a diagonal road. That’s the distance of 15th to Real Ballard. It’s to serve serves a commercial center which will be more people’s destination as it grows. In the past we’ve had too many routes that go past but not to commercial centers, and that’s a lost opportunity that Metro is finally starting to correct. On Roxbury Street the deviation is ten blocks, but again I don’t see that as excessive. The biggest problem with the current situation is the lack of an all-day express alternative between Burien and downtown, but that has been a hole in Metro’s network ever since I started riding it. I have transferred from the 120 to the C going from Burien to the Junction. Maybe. That part of the 560 is slated to be replaced by a 574 extension in the 405 BRT restructure. Please don’t rehash the Westwood Village deviation again. The decision was made in 2012, and Metro isn’t revisiting it. Despite Metro/SDOT making some noise about alignment alternatives, Rapid Ride H will follow the exact same routing as the 120. Each routing choice has been agonized over in the past, and the arguments in favor of the current route are stronger than the arguments for any alternative. The item to note is that the southern portion of the route is used for local access (and is well used), not as an express to downtown. Therefore stopping at destinations like supermarkets, drug stores, and Target is more important and raw speed to downtown. Starting the Westwood Village deviation in 2012 added a bunch of useful destinations directly to the line, the most important of which were three mainstream supermarkets (Safeway, QFC and Target) to a line that passes through “food deserts.” Westwood Village violates the “be on the way” principle by 4 blocks, but is too important to pass up. I questioned the White Center routing along 15th Av SW, instead of the faster 17th Av routing that the 560 uses. Then I realized that the Walgreens, Bartells, and two Asian supermakets are all along 15th, while 17th offers no such amenities. 15th Ave brings the route closest to the most important destinations for heavy transit users, and should be retained for a Rapid Ride route. I general, I really dislike the practice of Metro trying to enumerate preferred destinations that they think people want to take the bus to, then zig-zag the bus to try to minimize the walking distance to the preferred destinations, at the expense of forcing everyone riding past to sit through it every single trip. This is the same kind of thing that also led to B-line’s Overlake Village Deviation, rather than staying on 156th – which every person trying to get between Redmond and Bellevue on a bus is required to sit through (outside of the 232’s 5 trips per day). If you don’t like it, your only options are to either deal with it, or get a car. It is also worth considering that travel time to downtown is about far more than downtown – it also determines your travel time to anywhere north or east of downtown. The deviation is just one more thing making White Center so isolated from the rest of the city, to the point where a bus to Wallingford would be the equivalent of a car trip to Bellingham. In the end, instead of us speculating on how big of a destination Westwood Village is, the data should speak for itself. If it is really the place where everybody was desperate to get too, yet unwilling to walk 4 blocks to do it, the ridership stats should show 20 people getting on and off the bus at Westwood Village. I admit I hardly travel to that part of town, so don’t have first-hand knowledge, but the prospect of 20 people getting off a bus every 15 minutes to visit an “ok” shopping center with loads of free parking, I believe to be very unlikely. That said, if you can show me stop-level data that indicates more person-minutes saved than spent with the deviation, I’ll drop my objections. The bus should be on the main pedestrian street in White Center, whatever that is and if it has one, for the same reason that buses run along University Way, Broadway, and 45th. Part of what makes urban areas work is having a bus steps from the densest walk-up shops and mixed-use buildings and plazas, and seeing them from the bus.. This serves the most people, maximizes ridership, and enhances community ties. I’ve only been to White Center a few times so my impressions are limited, but it seems like 15th is a reasonable choice for a main street, and if that is correct then we should think twice about rerouting buses away from it. If there’s another main street they should move there. If there’s no main street, just peanut-butter sprawl, then they should create one, and having buses on 15th may be a way to start. I was surprised when Metro elevated Westwood Village as the second urban village in West Seattle, because I always thought the two largest villages should be the Junction and White Center. (Even if most or all of White Center is outside the city limits, depending on how you define it. But that may change if Seattle annexes it, which AFAIK is still in slow process.) But for whatever reason, Seattle and Metro have put their cards into Western Village as a place to channel growth. And if I recall it has a QFC which people presumably go to weekly, and other stores which they may go to once a month or a few times a year, which may be more than they go to any other particular location in the area. And if a significant percent of the surrounding people do that, it adds up. So, do people do that, I don’t know? Is Westwood Village likely to grow and be as popular as the city hopes? I don’t know, but it is the city’s strategy for now. The next issue is whether a bus stop on Delridge six blocks from the shops is close enough. That depends on whether people see it more as a connection or a deterrence, and the answer changes depending on the density of the neighborhood.and intangible factors. Six blocks is a short distance in the suburbs or Greenwood, but a long distance in the U-District or downtown. So people on 80th can’t expect a separate bus from 85th, but in the U-District there’s a tension between University Way and Roosevelt, and whether a bus on Roosevelt/11th is “close enough” to the U-District, and conversely whether RR should detour east to U-District Station and back or whether that’s too detrimental for north-south trips. That’s the situation here with Delridge and Westwood Village, although it’s a different kind of place and maybe that suggests a different answer. It requires weighing the factors and not presuming too much about what people want to do and will want to do in the future. Routing the 120 away from Westwood Village may be the right answer, but I want to make sure we’re not being too hasty and damaging pedestrian-oriented urbanism unwittingly. The residential-only lower-density sea around the village islands really is a problem, and straight grid routes that bypass the centers can be a hinderance to transit’s usefulness and mode share potential. Other cities with grid routes like San Francisco, Vancouver, and Chicago, also have mixed commercial-residential uses all along those streets, so there are constantly people going to every block. In residential-only areas you have only residents coming from the area, whereas in mixed areas you have both residents coming from it and visitors going to it. Delridge is too far on the residential side as far as I’m concerned, so the bus needs to go through as many villages as it can to give people access to things. The problem of a slow trip from Burien to downtown, or Delridge to White Center, is a separate one, and maybe we’re trying to do too much with one bus route. I have always thought there should be a Burien-downtown express, and there might be value in a limited-stop route between Burien, White Center, Delridge, and downtown. That’s distinct from people in Delridge and the suburban part going to both Westwood Village and White Center, which may need to be a different route to avoid the tradeoff between slow through trips and intermediate-center access. Hello, I’ve lived on this corridor for quite awhile now (North Delridge, White Center, and now, Burien) and for the last two years without a car (I got rid of my car because of the options the 120 presents). As I recall from SDOT submitted feedback and it showed that quite a few people use the 120 for MORE then just commuting downtown. I know that I do…I use if for day to day needs as well as getting to work in Pioneer Square. Connecting the H line to Westwood village is something I am 100% for regardless of the deviation and lost mins. I know that I frequently use the stop at Westwood Village to get groceries and supplies (both after work and on the weekend). I live at 124th st, and you have to go to either Westwood Village or Burien to go shopping (and the latter is just the Safeway, as QFC, PCC, and Fred Meyer are not close to the Transit Center). Eliminating Westwood Village from the route would severely limit options to riders that use the 120/H for anything other then commuting. We should be focusing on equitable transit, and that means looking at the needs of ALL riders, and not just commuters. Seems to me it might be good at putting the West Seattle Bridge improvement money into making the new Link bridge compatible with both buses and light rail and getting it built sooner. West Seattle light rail will have gaps in service to make space for Eastside trains, so even when West Seattle Link gets operating the H could fill those gaps. Interesting idea, but in West Seattle’s case the bridge would have to get designed and approved by a number of regulatory entities including the Coast Gaurd, environmental regulators, Native American interests and maybe the Port. Then it would take years to build. That kind of pushes it to 2030 anyway. On the other hand, the Ship Canal crossing won’t be in Link operation until 2035. Plus, the 15th Ave bridge may need to be closed and replaced by then. That’s the place for a bus+rail bridge! How can they do this entire project and fail to fix the ONE biggest problem with the 120 which is that traffic likes to back up past Alaska in the mornings, so on the days with the worst traffic the bus will not help. Delridge has a ton of NB traffic in the morning, I don’t know how you can possibly create a ‘rapid’ bus that not only doesn’t get its own traffic lane but will also have to presumably pull into the parking lane for stops and then re-merge with traffic. Also, the bike route is disappointing. The parking should be moved to adjacent streets, not the bike lanes. It’s also unclear how a full reconstruction of the street benefits bus riders. It seems like that aspect should be saved for another time when there are not budget issues that are causing critical projects to not be delivered. Once a bus route gets routine, regular service upgrades in the name of routine, incremental upgrades, it could still be slated for an upgrade to BRT/RapidRide later. But once it goes through the “mother of all upgrades” and is fully branded a “RapidRide,” and once you’ve torn up the street and inconvenienced residents and businesses to make it so, politically you’re kind of stuck with what you’ve got. Until, perhaps, ST7. Words do matter, especially when politics are involved. Maybe this is semantics and/or marketing, but I was never under the impression that Rapid Ride was meant to be proper BRT. Metro seems to focus on “rapid” meaning “the bus comes frequently enough you don’t need to bother planning your schedule” NOT that it means “the bus will get from your stop to the final destination really quick”. So it seems to me that for Metro, not having ROW on routes isn’t ideal, but it won’t automatically disqualify the routes from being RapidRide as long as they can throw enough buses on the route to keep them very frequent. Honestly, I think the Rapid Ride branding is stupid. We already have multiple bus systems in Seattle between Metro, ST, CT, streetcar, etc. The system should be less confusing, not more confusing. If the idea is that a Rapid Ride bus route is better than a normal bus route, than that comparison requires 2 bus routes serving a similar area. But most of the Rapid Ride corridors are solo lines, right – what’s the “local” alternative to the E line? And when 2 routes overlap, like the D and the 32 in Seattle Center, they are pretty much interchangable with each other. When RapidRide was first planned the brochures said it would be “like Swift”, which I took to mean a limited-stop overlay, a kind of “poor man’s Link”. Along with transit/BAT lanes to make it rapid. And secondarily off-board payment, ORCA readers, and real-time signs. I think “BRT” was in the marketing to some extent. But the tax-cutting initiatives cut some of its funding, and the 2000 recession probably didn’t help. Then Metro announced it couldn’t afford limited-stop overlays so they would be the only routes in their corridors. That necessitated stops every 0.25-0.5 miles instead of 0.5-1 miles. It’s unclear how much this was the initial plan or how much it was forced on them by budget constraints. If it was the initial plan then saying it would be “like Swift” was misleading. Ever since Swift started there have been perennial debates over what qualifies as BRT, whether Swift is, whether RapidRide is, and what criteria are essential. But first we should look at the term “Rapid”, which has its own perennial debates. To me “Rapid” means “faster travel time than a regular bus”, and 5-15 minute frequency, including evenings and weekends. That’s what a subway does and what makes it so effective. To get that speed it needs to be grade-separated or have exclusive lanes and signal priority, and the stops not too close together. (BAT lanes can be an acceptable compromise.) So “rapid transit” to me means something with these characteristics, and can be a train or a bus. But some people define “rapid transit” differently, as heavy rail, and sometimes with stops closer than I’d like. So some people say, “This district/city has light rail but no rapid transit.” (Huh?) Or outside the US you even hear, “This district/city has frequent buses but no transit.” (Double huh?) On the other extreme, some American cities call their bus agency “rapid transit” even when it’s as slow and infrequent as Metro in the 80s. BRT started in Curitiba as, I gather, an ultra-frequent system with exclusive lanes and not too many stops. It may have freeway-like segments, or citiies without freeways often have wide boulevards with transit lanes that run faster than our arterials. Los Angeles came later with frequent freeway routes with express- or limited-stop spacing. Then Swift came along with its mile-wide spacing and BAT lanes with a local overlay on the same street. And now RapidRide, whose only remaining features are frequency, and sometimes BAT lanes and and signal prority but usually not. So there we are. Is it BRT? That’s a perennial question. Is it useful to call it BRT to encourage more of it, or does it hinder us from getting higher-level bus service. Metro and the city finally bowed to criticism and removed “BRT” from its marketing, so “Roosevelt BRT” was renamed “Roosevelt RapidRide”. Although “BRT” may linger in some references, and it does in people’s minds. The best way forward is just to concede “RapidRide’ for its current level of service, and try to make it better incrementally. I could see Pierce County adopting the name RapidRide, and 522 BRT and 405 BRT adopting the name Swift. That would make sense and distinguish them as full-stop and limited-stop. But county/agency branding may get in the way.